The SA-Dextramer combine the powerful Dextramer technology with a biotin-mediated click-on functionality. APC) or without a fluorescent marker. You simply add your biotinylated molecules e.g. 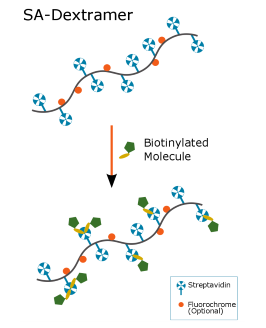 biotinylation reagents may be used, thus enabling biotinylation of almost any type of molecule or surface. antigen specific T cells, in a sample volume of 50-100µl. labeled Dextramer, each having a different valency for biotin-binding. Please refer in below.